Ski from the summit of Europe with one of our IFMGA Mountain Guides. Our unique itinerary has us skiing on both side of the mountain whilst also spending time getting to know the local area and people. Travel, culture and adventure all in a weeks trip! This is classic ski mountaineering, snow aretes, crampons, crevasses and variable snow. Elbrus is an inactive volcano located in the western Caucasus mountain range, near the Georgian border in Kabardino-Balkaria and Karachay–Cherkessia, Russia. With an elevation of 5,642 meters(18,510 feet), it is part of the Caucasus Range that straddles Asia and Europe, although most geographers place it in Europe. This makes it the tallest mountain in Europe and one of the Seven Summits, the highest mountains in each of the continents and peak bagging climbers aspire to summit all of them. Mount Elbrus isn’t a technical mountain but the crevasse fields, high altitude, weather, and variable snow conditions make this a challenging climb for beginners and experienced climbers alike, requiring the use of crampons and ice axe. Our friendly and experienced guides will teach you everything you need to know to be successful. The Northern route is wilder than the Southern side of the mountain. There are no hotels, cable-lift, snowmobiles or snow-cats, but there is also good enough infrastructure for comfortable ascent. It is less crowded because of this. There are two main camps there for accommodation. So this route is preferred option for ski ascents or people who prefer wilder climbing routes. The way to the North Side starts and finishes in in Pyatigorsk. From the hotel we have about 4-5 hours by car transfer until the Base Camp at 2500m. The last part (about 15km) of the route is really off-road so we use special Russian jeeps - UAZ. After acclimatisation, we move to high camp with shelter at 3800m. Both camps have comfortable separate dining areas for meal times etc. Every day, electricity is supplied in the evening time from generator and solar panels. We provide all food, so you have to carry only personal gear from camp to camp. Our unique itinerary is designed to give us a variety of skiing whilst keeping the trip as flexible as possible. Building on our experience of skiing on the mountain in 2018 (see video below) we have developed our 2019 programme to spend a little more time on skis as well as getting to know the local area and people. We aim to keep the itinerary as flexible as possible, as well as getting well acclimatised. We start on the south side of the mountain and use the lift system to get to the snow and ski quickly. After spending a night at altitude, we transfer to the wild and quiet north side of the mountain to make a ascent away from the busier "normal route" on the south side. Arrival Mineralnie Vody after flight from Moscow. Meet group and then transfer to Terskol village on the south side of Elbrus. Gear check and night in three star Hotel. Our first acclimatisation day: Ski tour to Cheget shoulder at 3100, or with chair lift to 3600m. Climbing this separate peak gives us great views of Elbrus whilst testing our gear and getting to altitude. The first day on the slopes of Elbrus. Using the lift system on the south side, we start skiing at 3500m and complete an acclimatization ski tour to Priut 11 (4050m). Ski descent to "refuge 3900m" where we spend the night. A chance to breathe some thin air and get the legs moving again. Acclimatisation days are all about adapting, without getting overly fatigued. This is where the real work begins. Ski tour to 4500m after an early start from the hut. We can travel lightly during these early days, getting some good altitude and hopefully some good snow to ski as well. We ski back to the lift at 3500m before descending and a minibus transfer to Pyatigorsk. Night in hotel. After a evening out in the town of Pyatigorsk and a rest at lower altitude, we transfer to the north side of Elbrus after a four hour drive. We aim to bypass the basecamp and walk and ski to the north huts at 3800m. This takes around five hours from the road head. The huts are perched in a wonderful position with good skiing directly above. Our first potential summit day. the climb to the summit is around 1900m in elevation gain, and will take several hours. The last part often completed on foot depending on snow conditions. Our aim is to then descend the south side of Elbrus making a traverse of the mountain. Descending to Terskol and the hotel in the same day. This is a spare day built into the programme, giving us another weather window. Only one attempt is possible, but we have a choice of two days depending on the weather, conditions and our acclimatisation. Transfer from Terskol to Pyatigorsk. Time for some rest, dinner out and some tourist time. Transfer to Mineralnie Vody for international flight home. The downhill terrain on Elbrus is not extremely technical. Several short pitches of no more than 40 degrees will be found, but generally slopes average a modest 15-30 degrees. Natural hazards do exist however, including: rocks, crevasses, variable snow, and ice to breakable crust. Due to these hazards, in addition to the strenuous nature of skiing at 18,000 feet, we require that the participants in the Elbrus descent be advanced skiers or boarders, preferably with some high altitude experience. Some example European peaks would be the Grand Paradiso, Mont Buet, or other 4000m peaks in Switzerland. 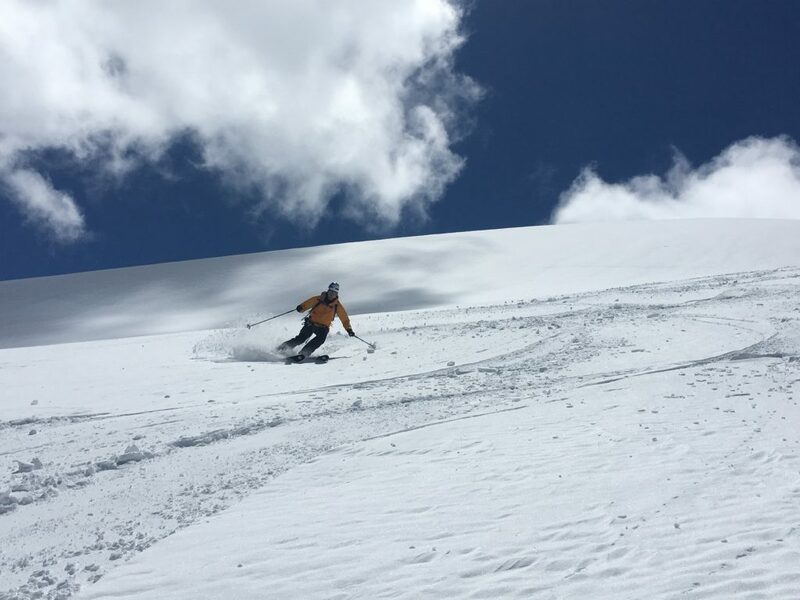 Sam getting some spring powder turns in at 4000m, Elbrus Ski Expedition. 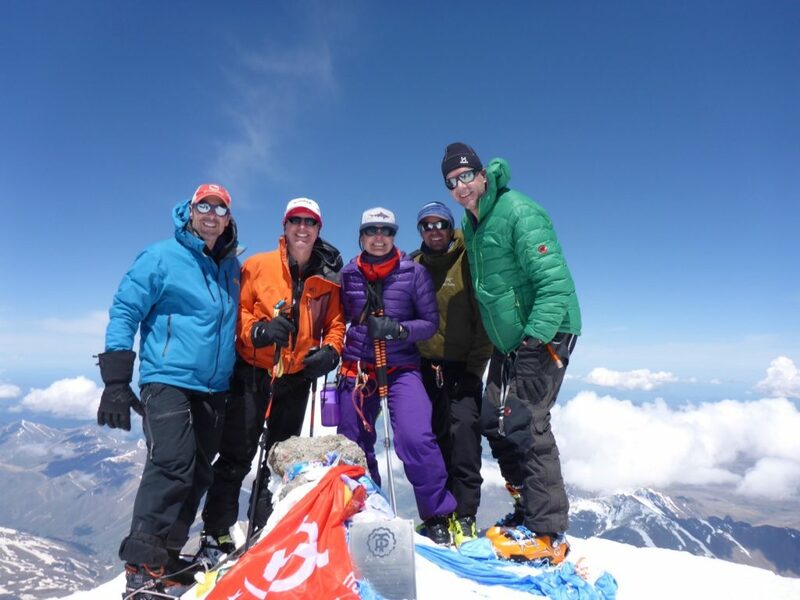 Our Elbrus expedition is nine days long including flights and transfers etc. If you'd like to extend your trip with sight seeing, or climb a couple of peaks in the alps for acclimatisation in the days before flying to Russia then let us know. Climbing Elbrus on skis is extremely physical and tiring. It is common to spend tweleve hours for the ascent and descent and you must be capable of making good safe turns with a rucksack, in any snow conditions and at altitude. All after having done eight hours of ski mountaineering! Not that we want to put you off, but you must be well prepared before the trip. If your not sure, then a weekends ski touring with us prior to attempting Elbrus is a very good idea. A weekend in the alps prior to the expedition would also give you some good acclimatisation and a chance to test your equipment. Saturday 9th to Sunday 17th May 2020 - 2150€ per person. All Guiding fees. All necessary local transfers. All accommodation according to the program. Full board throughout the trip, excluding farewell dinner; one Vertical Frontiers Mountain Guide, and one local Russian Guide. A Cook whilst on the mountain. Necessary formality (visa support, passport registration); National Park fee. International and internal Flights to / from MinVody airport; Unexpected preliminary evacuation cost; Insurance. Personal expenses, alcohol. Visa costs. If we, or you, choose to end the expedition early and return to town, then the extra nights accommodation in hotels are not included in the price. Please do contact us with any questions you might have.